I’m a big fan of snacking and nuts are a favourite. Filling and protein packed they make a great snack or accompaniment to drinks. So I thought I’d share with you a couple of my favourite spiced nut recipes. 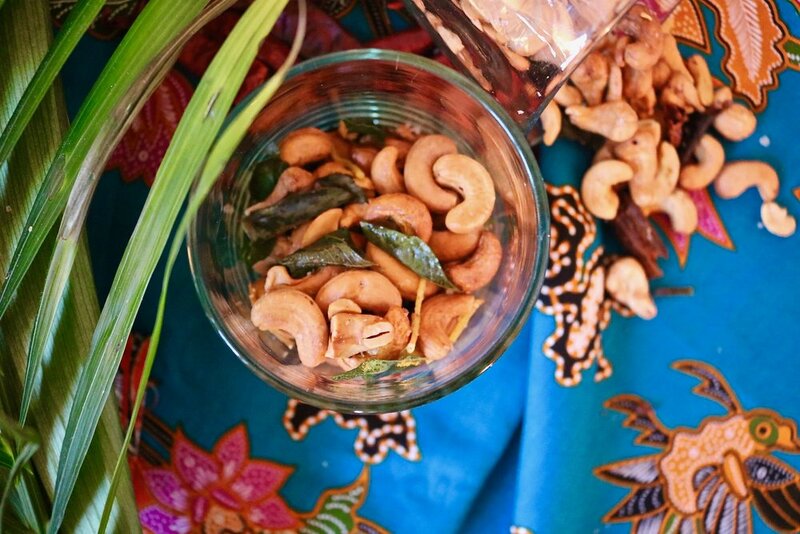 Curry leaf and ginger and kaffir lime, salty sweet cashews. Spiced nuts are popular world over, but I love the fresh fragrant leaves here. In Sri Lanka you get red skin peanuts sold on trains and on the streets, cooked with dried chili, fresh fried curry leaves and salt, packed in a writing paper. The addition of ginger here was something we had at a bar in Kandy, so good, good for you, and pretty addictive. Then an old favourite of mine is kaffir lime leaf, chili and the mix of salty and sweet, classic south east Asian flavours. Instead of frying the nuts I roasted them to make them healthier, you can also switch the cashews for peanuts if you like, but I’m not convinced any nut would work with these flavours. These are great to serve guests with drinks, I always like when you get given some kind of salty snack when you get a drink out. It can be simple & cheap but I think it makes a difference and is basic hospitality in so many cultures. If you can’t find the fresh leaves you can use frozen, or dried at a push. Most Asian supermarkets have frozen kaffir lime leaves, which work well. Curry leaves can be harder to come by unfortunately. You can order them online, buy more than you need as they freeze well. So try these out, they’re both easy and will be sure to impress. Pre heat oven 170 celsius. Mix the cashews with a teaspoon of the coconut oil. Spread on a parchment lined baking sheet and roast for about 12 minutes until golden. While you’re roasting heat a small frying pan, add the rest of your coconut oil and fry the ginger until crisp. Remove with a slotted spoon, place on some kitchen paper, add the curry leaves the pan and fry for about 30 seconds, until they start to crisp, remove with a slotted spoon onto the kitchen paper. Once the nuts are ready, transfer to a small mixing bowl with the ginger and curry leaves. These can also be stored in an airtight jar.